Today's photograph is courtesy of Dawn Endico (Dawn's photos on Flickr | original | BPotD Flickr Group Pool). Thank you, Dawn. For those of you interested in identifying flowers you might encounter in the wild within North America, Dawn has created a handy visual identification tool for North American wildflowers. Whitish gentian or arctic gentian is found in alpine areas of western North America and east Asia. From Alaska, its range extends southwards to New Mexico; from Siberia, it reaches south to Sikkim. 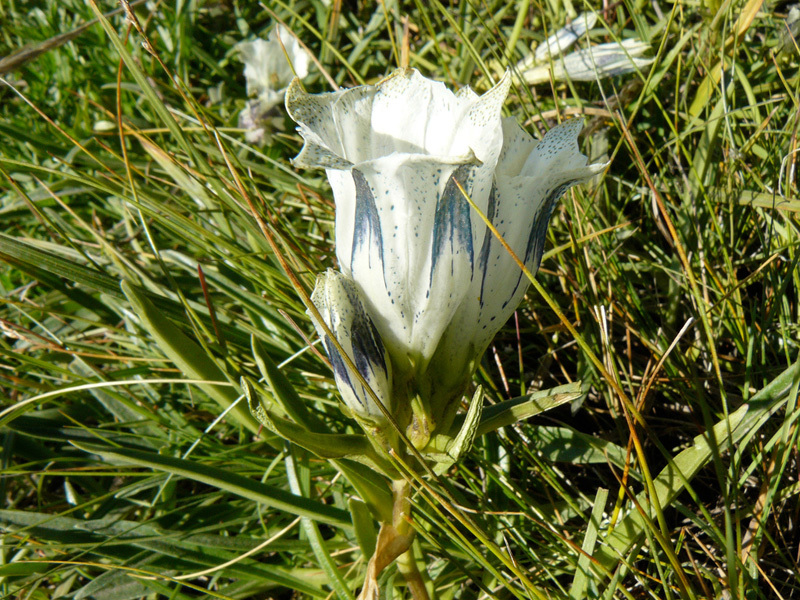 Plant-life.org has a summary description of Gentiana algida, while the Flora of China has its usual taxonomic account. Gentian violet on the other hand has an indelible purple hue one of the most extreme and stable colours used as a lab stain in medicine and as actual tx of oral candidiasis or trush mainly in infants. Is there a photo of it on this site? "The Gentian Research Network is a free, not-for-profit, web-based forum for worldwide research on the natural history and evolution of the flowering plant family Gentianaceae (gentians)." Thank you Dawn and Daniel! Another extraordinary plant being new to me! Love it's biogeography: what a totally cool bi-continental range! Thank you for the link to Dawn's flower identification tool. What a great idea! I have bookmarked the site for future use and enjoyment! I am so pleased to see this gentian. What a wonder for me. I only know of the purple ones. It is a great photograph and I feel greatful to see it. the markings on that gentian are stunning. thank you for highlighting it today!